The entrance to Solemn Mass on Sunday, October 7, 2018. Father Jay Smith (L) and Father Matt Jacobson, followed by MaryJane Boland and Father Jim Pace. Br. Desmond Alban, SSF, Minister Provincial, was with us for the Feast of Saint Francis of Assisi and for the first Sunday in October. There were no lesser festivals in an American Prayer Book until 1979. Prayer Book Studies IX: The Calendar (1957) prepared the way for the book that came to be known as Lesser Feasts and Fasts (1963) (LFF). That book was authorized for optional use beginning January 1, 1965, by the 1964 General Convention. However, Saint Mary’s was among the many catholic-minded congregations where the calendars and rites of the Roman Catholic Church had been interpolated into the Prayer Book rite since the Oxford Movement began to reshape worship for many Anglicans. By mid-twentieth century, liturgical scholarship would give leadership to revised orders of worship in Western Christian denominations. None was more influential than the changes made in Roman Catholic worship after Vatican II. That said, overall I think it’s fair to say that the Episcopal Church’s 1979 book is considered by many to be the best of the lot. For Episcopalians, Prayer Book Studies 19: The Church Year (1970) recommended the calendar and the Eucharistic lectionary that would become the calendar and Eucharistic lectionary in the 1979 book. Since then, frequent changes have been made to the calendar of the church—and because Church Publishing doesn’t specify in printings of the Prayer Book the date of the General Convention that has authorized the changes, it’s really hard to keep track of them all. We are expected to make choices—and we’ve tried to do so with careful study, thought, and prayer. Prayer Book Studies IX described its work this way, “The choice of commemorations in the proposed Calendar of this Study has been made primarily on the basis of selecting men and women of outstanding holiness, heroism, and teaching in the cause of Christ, whose lives and deaths have been a continuing, conscious influence upon the on-going life of the Church in notable and well-recognized ways” (page 37). Anglican Prayer Books use the word “saint” in the New Testament manner, to refer to the baptized, and they give the title “Saint” to the holy women, men, and angels of the New Testament. Since 1979 the Church’s General Convention has filled the calendar with optional commemorations—as have the Church of England and the Roman Catholic Church to name two others. My own experience has been that less is more. The Choir Season resumed on the first Sunday in October. The choir will sing at all Solemn Masses through Corpus Christi, June 23, 2019. Beginning with Prayer Book Studies IX, the-then Standing Liturgical Commission did not think it necessary always to state known date of the death of the person who would be recommended for commemoration—and one wonders why given the ancient importance of a Christian’s dies natalis, a Latin phrase referring to a person’s “birthday” to heaven. So a year ago, we decided to commemorate Charles Wesley, 1788, and John Keble, 1866, on March 29, the date of death that they share. We did the same for William Law, 1761, and Dietrich Bonhoeffer, 1945; both of whom died on April 9. Similar decisions are being considered for 2019. THIS SUNDAY AT SAINT MARY’S . . . On Sunday, October 14, 2018, the Very Rev. Robert Willis, dean of Canterbury, United Kingdom, will be the preacher at the 11:00 AM Solemn Mass. He became dean of Canterbury in July 2001 and has been an influential leader in the Anglican Communion. It’s a great honor for us to welcome him back to Saint Mary’s pulpit. —S.G. YOUR PRAYERS ARE ASKED FOR Glenn, Bill, Mickie, Michael, Jorem, Erica, Eloise, Donald, Irma, Al, Flor, Marge, Chandra, Greg, Alexandra, James, Karen, Carlos, Susan, Marilouise, Timothy, Barbara, Dennis, Robert, Abraham, Randy, Burton, Greta, May, Heidi, Takeem, David, and Sandy; for Rebecca, deacon; for Horace, Gaylord, Louis, and Edgar, priests; for all the benefactors and friends of this parish; and for the repose of the soul of Patrick White. GRANT THEM PEACE . . . October 14: 1915 Margaret Farson; 1928 Lemuel Torrens; 1929 Wallace Clark Brackett; 1976 Harriet O’Brien. IN THIS TRANSITORY LIFE . . . Patrick White, a longtime friend of Saint Mary’s, died on Thursday, October 11, in Washington, D.C. He was a member of Saint Paul’s, K Street. In years gone by, Patrick would worship here when visiting the city and often helped to decorate the church at Christmas and Easter. He was a member of the wider Saint Mary’s community. Please keep Patrick, his family and friends, and all who mourn in your prayers. WOULD YOU LIKE TO BE BAPTIZED OR CONFIRMED? . . . The Right Reverend Andrew M. L. Dietsche, the bishop of New York, will be the celebrant and preacher at the Solemn Mass on All Saints’ Day, Thursday, November 1, at 6:00 PM. If you have been thinking about baptism, confirmation, or about being received into the Episcopal Church, we would be glad to help. All Saints’ Day is one of the four days each year when the Rites of Initiation—baptism, confirmation, and reception—are normally celebrated here at the parish. If you would like to be baptized, confirmed, or received on November 1, or if you would like to reaffirm your faith, please speak to Father Gerth or Father Smith or call the Parish Office. THIS WEEK AT SAINT MARY’S . . . Friday, October 12, 6:30 PM, Centering Prayer Group, Atrium, Parish Hall, Second Floor . . . Saturday, October 13, 2018, 8:00 PM, Miller Theatre Early Music Series, Stile Antico: “Elizabeth I, Queen of the Muses.” Music by Byrd, Dowland, Farmer, Ferrabosco, de Lassus, Sandrin, Tallis, Taverner, Weelkes, Wilbye, and Willaert . . . Sunday, October 14, The Twenty-first Sunday after Pentecost: Sung Matins 8:30 AM, Mass 9:00 AM, Adult Forum 10:00 AM, Mass 10:00 AM, Solemn Mass 11:00 AM, Solemn Evensong & Benediction 5:00 PM . . . Wednesday, October 17, 6:30 PM, Bible Study Class, Saint Benedict’s Study . . . Thursday, October 18, Saint Luke the Evangelist, Morning Prayer 8:30 AM, Noonday Prayer 12:00 PM, Mass and Healing Service 12:10 PM, Evening Prayer 6:00 PM, Mass 6:20 PM . . . Thursday, October 18, 6:00–8:00 PM, the Gallery in Saint Joseph’s Hall, Artists’ Talk: Ingrid Sletten and Deborah Holcombe. CHRISTIAN EDUCATION . . . Brother Damien, SSF, and Brother Thomas, SSF, continue their four-part series on Franciscan life, theology, and spirituality on Sunday, October 14, at 10:00 AM. The theme of this Sunday’s discussion will be “The Franciscan Way(s): Who Franciscans are and how they live.” Next Sunday, October 21, they will discuss “Franciscan Distinctives: Theology and spirituality” and, finally, on October 28, they will discuss “Franciscans at Saint Mary’s: Envisioning our life together.” Coming up: on Sundays in November, Father Peter Powell will lead the class in a discussion of the Elijah/Elisha cycle in 1 Kings 16:23–2 Kings 13:25. The Adult Forum meets on Sundays at 10:00 AM in Saint Benedict’s Study . . . The Wednesday Night Bible Study Class meets next on October 17 at 6:30 PM. The class is reading the Letter of James and is led by Father Jay Smith. The classes on Sunday morning and on Wednesday evenings meet in Saint Benedict’s Study. AROUND THE PARISH . . . Parishioner Bill Poston was recently admitted to the VA Hospital at First Avenue and Twenty-third Street for tests and physical therapy. He hopes to be able to return home early next week. Please keep him in your prayers . . . We will be mailing packets for this year’s Stewardship Campaign at the end of next week. We invite you prayerfully to consider making, or increasing, your pledge for the coming year. Our needs are great. Our mission is clear. We welcome your support . . . We still hope to receive donations for altar flowers on the following dates: November 18 and all Sundays in January, including the Epiphany on Sunday, January 6. If you would like to make a donation, please contact the parish office . . . The Rector will be on vacation from Thursday, October 18. He returns to the parish office on Wednesday, October 31 . . . Attendance: Last Sunday 195. A FLOWER GUILD EVENT . . . On Tuesday, October 16, 6:30– 8:00 PM, celebrity florist Peter Krask and the members of the Saint Mary’s Flower Guild will lead, and host, a Floral Design Class here at the parish. Those attending the class will create an autumnal flower arrangement to take home that is suitable for the upcoming season! Mr. Krask, who often appears on NBC’s Today Show, will demonstrate and teach how to select, prepare, and arrange flowers. Those of all skill levels, including beginners, are encouraged to attend: no prior floral design experience is necessary! All materials are provided, and complimentary wine and cheese refreshments will be served. $85 admission with proceeds to benefit St. Mary’s Homeless Outreach Ministry. Due to space constraints and the desire for all participants to receive individual attention and assistance, the size of the class is limited to 25 students. You can read more about Mr. Krask on his website. You may register for this event online. If you have questions, please contact Peter Ruane. FROM THE MUSIC DIRECTOR . . . The setting of the Mass on Sunday is the four-voice Missa secunda of Hans Leo Hassler. Hassler was born in Nuremberg and baptized on October 26, 1564. His musical career bridged the late Renaissance to the early Baroque periods. His initial musical instruction was from his father, Isaak Hassler (c. 1530–1591). Hans Leo left home in 1584 to study in Venice with Andrea Gabrieli (c.1532–1585) and become a friend and fellow pupil with Gabrieli’s nephew Giovanni (c.1554–1612). Thus, Hassler was one of the first of a succession of German composers to experience in Italy the musical innovations that were shaping what would later be identified as Baroque style. Hassler was recognized in his day not only as a composer, but also as an organist and a consultant on organ design. Although Hassler was a Protestant, his early compositions were for the Roman Catholic Church. His Missa secunda, first published in Nuremberg in 1599, is a model of efficient and concise text setting. The text is mostly set syllabically, and much of the musical texture is homophonic and rhythmically energetic. Often Hassler has the higher two voices and lower two voices singing phrases in playful alternation. These aspects all help to set forth the text with particular clarity. 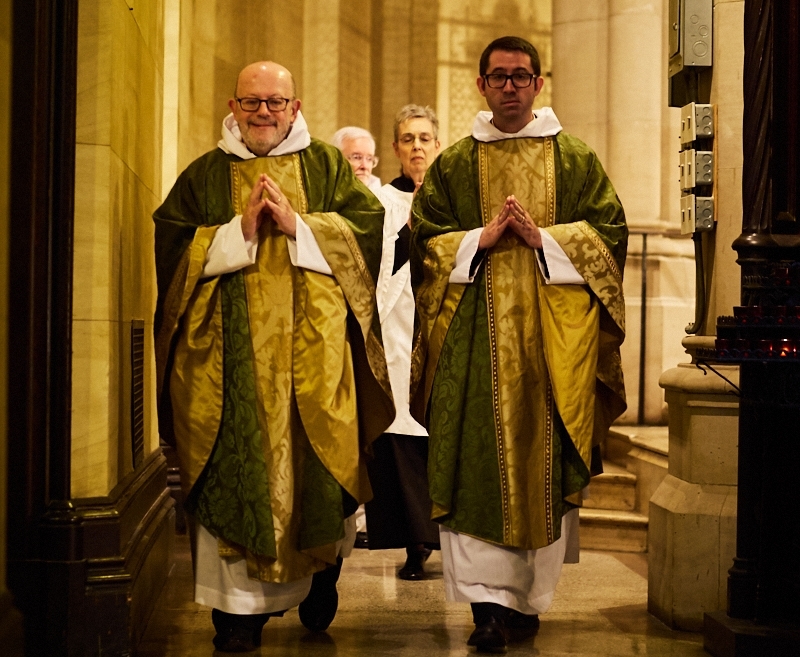 The motet at Communion, I will wash myself in innocence, was composed in 2003 by David Hurd, organist and music director at Saint Mary’s, to mark the diaconal ordination of Leighton James Lee, now dean of the Cathedral of the Redeemer, Calgary, Alberta. First sung at Dean Lee’s ordination to the priesthood shortly thereafter, it is a four-voice choral setting of a portion of Psalm 26 (vs. 6–8, 12), reflecting upon the preparation for corporate worship and its desired outcome. As the proclamation of the Gospel is announced. The thurifer, Marie Rosseels (L with eyeglasses) waits to hand the thurible to Father Jim Pace. OUTREACH AT SAINT MARY’S . . . Donations and volunteers are needed for our next Drop-in Day in late October or early November, and for the many requests for assistance between Drop-in Days. We are in particular need of basic items such as the following: packs of new underwear in various sizes for both men and women; slacks for both men and women, including jeans, chinos, khakis, etc. ; packs of new socks, white and black; rainwear; knapsacks; and toiletry articles. Please contact Father Jay Smith if you would like to volunteer for this important ministry or if you would like to make a donation . . . We continue to receive nonperishable food items for our outreach partner, Saint Clement’s Food Pantry. Please place those items in the basket near the ushers’ table at the Forty-sixth Street entrance to the church. We are very grateful to all those who continue to support this ministry. A tower construction crane across West 47th street from Saint Mary's. A BOOK LAUNCH . . . Stephen Morris, formerly an Eastern Orthodox priest who served as chaplain at Columbia University, recently published a book entitled The Early Eastern Orthodox Church: A History, AD 60–1453. Saint John’s Church in the Village is hosting a book reading and signing to mark the publication of Stephen’s book. The event will take place on Monday, November 12: Evensong 6:15 PM; Book Reading and Signing 6:45 PM. Saint John’s is at West Eleventh Street and Seventh Avenue here in Manhattan. Stephen is a good friend of Saint Mary’s, who has taught in our adult-education program. From the Visual Arts Exhibit "Spirit's Flight. THE VISUAL ARTS AT SMV . . . An art exhibit entitled “Spirit’s Flight” is now on view in the Gallery in Saint Joseph’s Hall. Members and friends of the parish are invited to join the artists and to see their work. All are invited. This exhibition features the work of two artists, Deborah Holcombe and parishioner Ingrid Sletten. Ingrid and Deborah’s work, in different ways, explores the intersection between nature and the spirit. They have subtitled the exhibition “More Than the Eyes See: Combining Science with Revelation.” An Artists’ Talk for this exhibition will take place on Thursday, October 18, 6:00–8:00 PM. CONCERTS AT SAINT MARY’S . . . Saturday, October 20, 2018, 8:00 PM, New York Repertory Orchestra (NYRO). NYRO returns to Saint Mary’s for another season. On October 20, the orchestra will play music by Clyne, Mussorgsky, and Mendelssohn. Admission is free, but a donation is encouraged. Visit the orchestra’s website for more information . . . Saturday, November 10, 2018, 8:00 PM, Miller Theatre Early Music Series, Cappella Pratensis: “The Josquin Imitation Game.” Music by Josquin des Prez and Ockeghem, Van Ghizeghem, Busnoys, Willaert, and Gombert. From the theater website, “Josquin des Prez paid homage to his predecessors through the use of imitation. By the same token, subsequent composers played this game as a deliberate tribute, utilizing the same texts, melodies, and other characteristics of his music. The acclaimed Cappella Pratensis, known for their period interpretations, makes their Miller debut with a program anchored by Josquin masterpieces and exploring some of the great polyphonic works of the period by composers who inspired Josquin and those who were later inspired by him . 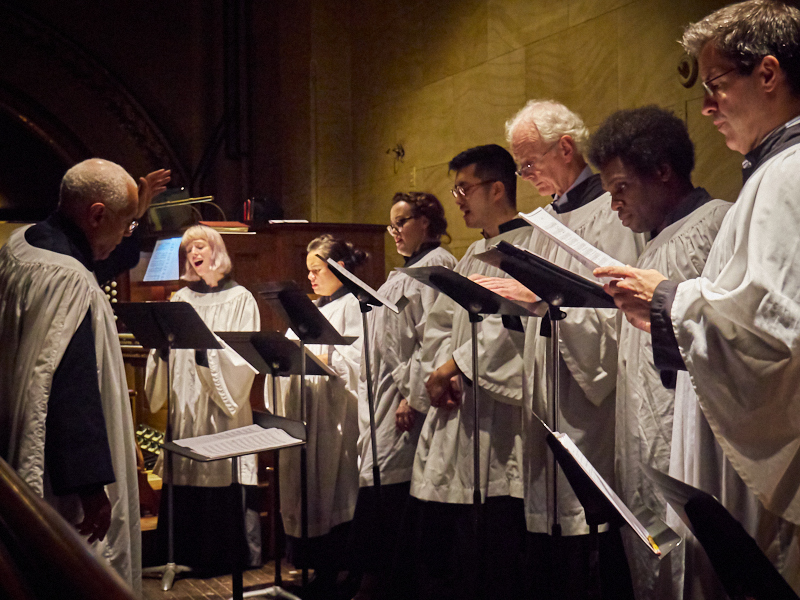 . . Tuesday, November 13, 7:30 PM, Lincoln Center’s White Lights Festival: The Distant Light, Latvian Radio Choir. LOOKING AHEAD . . . Tuesday, October 23, Saint James of Jerusalem, Morning Prayer 8:30 AM, Noonday Prayer 12:00 PM, Mass 12:10 PM, Evening Prayer 6:00 PM, Mass 6:20 PM . . . Monday, October 29, Saint Simon and Saint Jude, Apostles, Morning Prayer 8:30 AM, Noonday Prayer 12:00 PM, Mass 12:10 PM, Evening Prayer 6:00 PM, Mass 6:20 PM . . . Wednesday, October 31, Eve of All Saints’ Day, Evensong 6:00 PM . . . Thursday, November 1, All Saints’ Day, Sung Matins 8:30, Noonday Prayer 12:00 PM, Sung Mass 12:10 PM, Organ Recital 5:30 PM, Solemn Pontifical Mass 6:00 PM . . . Friday, November 2, All Souls’ Day, Sung Matins 8:30 AM, Noonday Prayer 12:00 PM, Sung Mass 12:10 PM, Sung Mass and Blessing of the Vault 6:00 PM . . . Sunday, November 4, 2018, Daylight Saving Time Ends.